In 1977, David Murray, current president of Fiesta Tents Ltd., founded Portable Stalling Inc., which started out as a supplier of tents and horse stalls for horse shows throughout Quebec and Ontario. In 1982, as a result of customers' frequent requests for party tents, the company expanded its business from horse shows to parties and weddings. Consequently, the name was changed to Tents for Events. In 1992, with the acquisition of another tent company, Tents for Events became Fiesta Tents Ltd. The name changes reflected the company's diversification into new markets across North America. 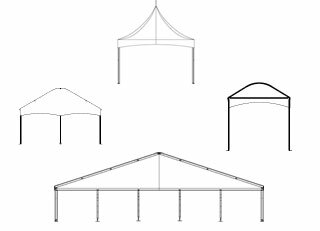 Fiesta Tents opened offices in Quebec City and Toronto, along with a manufacturing division in Montreal that designs and manufactures custom canopies, tents, marquees and clear-span structures for all occasions. Fiesta's products are designed to carter to the tent rental, party tent, golf course and hospitality industries. Today, Fiesta Tents is recognized in the industry for the creativity of its designs and installations. David Murray and his team are committed to helping you achieve success with all your events, whatever the size or challenge! Fiesta Tents focuses on attention to detail and rejects mediocrity. Our goal is to impress you every time. David Murray and his partners ensure that the company is constantly evolving and adapting its strategy to meet the needs of its clients and changes in demand. Thanks to its vision, mission and approach to total experience, Fiesta Tents is well positioned to remain an industry leader for decades to come.